substances) that the body needs. being it is living on. WHAT ARE SOME OTHER CHARACTERISTICS OF TAPEWORMS? in which animals (and plants) are organized based on common characteristics they share. ARE THERE DIFFERENT TYPES OF TAPEWORMS? the world, but is especially found in tropical areas. The dwarf tapeworm mostly affects children. As will be discussed below, some forms of tapeworms can cause a condition known as hydatid disease. WHAT LEADS PEOPLE AND OTHER ANIMALS TO GET TAPEWORMS? Early, immature forms of tapeworms can be present in some types of infected beef, pork, and fish. happens, other animals, such as cows, dogs, pigs, and fish may consume the tapeworm eggs. than one animal at different points in their lives. WHAT ARE SIGNS AND SYMPTOMS OFTAPEWORMS INFESTATION? body that feces comes out of) or appear in the feces. cysts can also form in the brain, a condition known as neurocysticercosis. Tapeworms are diagnosed when a doctor finds segments of the worms and/or eggs present in the feces. involuntary muscle movements. See the signs and symnptoms section for a description of cysts. areas with known tapeworm outbreaks. IS IT SAFE TO INGEST TAPEWORMS TO LOSE WEIGHT? No. Please see the MedFriendly Blog entry on tapeworm dieting for more information. WHAT ELSE ARE TAPEWORMS CALLED? 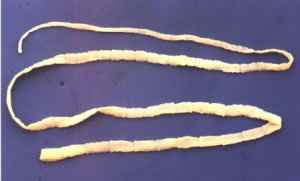 Tapeworms are sometimes referred to as, Cestoda, Cestode or Cestoidae. WHAT IS THE ORIGIN OF THE TERM, TAPEWORM?